Our window cleaning service uses 100% pure water to clean your windows, as this is scientifically proven to be the best method of window cleaning. Have you ever hosed down a window on a sunny day, only to find that once dry, your windows were now covered in white spots and smears? Why was that? The reason is that Tap Water contains many impurities such as calcium, phosphates, nitrates, sodium, potassium and chloride. It is these impurities that remain on your windows, leaving unsightly marks. Pure water is different! Pure water has amazing cleaning qualities! Explaining it simply, pure water is always trying to return to its natural impure state. Pure water wants to be dirty again! When applied to your windows, it attracts dirt like a magnet. To produce Pure Water we take tap water and filter it extensively until all of the impurities that leave those unsightly spots and smears on your windows, have been removed, leaving de-ionised (100% ultra-pure) water. This is achieved with our specialised water purifying equipment as seen to the left. The process is called “Reverse Osmosis”. Pure water is excellent at breaking down and dissolving dirt, leaving no residue of chemicals or detergent on the glass as no chemicals, or detergents are used with our pure water window cleaning system. Traditional window cleaning methods however, do involve the use of detergents and so always leave a sticky residue on the glass that actually attracts dirt! The result is that your windows get dirtier quicker! Ironic isn’t it?! As pure water leaves nothing but pure water on the glass, your windows stay cleaner for longer as there is nothing to attract the dirt back to the window and nothing for dirt to stick to so easily. What is more; Pure-water, due to the absence of tap water impurities, dries naturally to a sparkling clean finish. No spots. No smears. No marks. A further benefit of pure window cleaning over traditional window cleaning is that traditional window cleaners can only generally clean the glass, or else charge extra for the frames to be cleaned. With our pure water window cleaning system we clean your frames and sills as standard, for free! Why is this so important? Because if your frames are not cleaned, when it rains all the dirt from the frames will flow onto your clean windows! The result? Your windows were cleaned yesterday but they are dirty today! 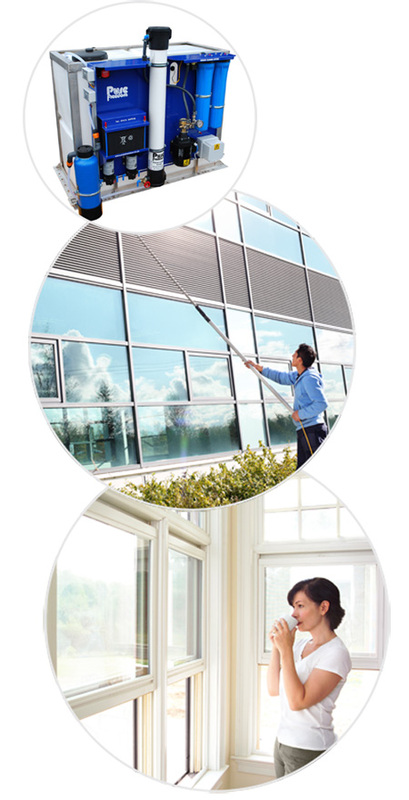 Our pure-water window cleaning system uses cutting edge technology to rectify these problems. The pure water is transported by van to your property. To apply pure water to your windows we use an extendable reach and wash water-fed pole with a soft bristle cleaning brush on the end. Pure water is then pumped up the pole and out through pencil jets in the brush head. The Pure water with its powerful cleaning properties rapidly softens even stubborn dirt on the window, the soft brush is used to agitate the softened dirt and the flow of pure water carries the dirt with it to the ground. The windows are left wet, but with no impurities in the remaining drops of pure water, remarkably they dry to a sparkling, smear free finish every time. If your windows have been cleaned using the traditional “squeegee” method with water and detergent, it may take two or three cleans using our pure water to remove the build up of that microscopically thin but very stubborn film of detergent residue. Don’t worry though! Two or three cleans will remove this residue for good, leaving you with windows to be proud of every time. Your windows will now stay cleaner for longer as there is nothing left for the dirt to stick to so easily. Longer intervals between cleans makes this a cheaper overall window cleaning service for you, the client! The pure water window cleaning method is just that good! See for yourself. We offer our window cleaning service throughout Crewe, Nantwich, Haslington, Shavington, Stapeley, Willaston, Weston, Bridgemere, Worleston, Winterley, Wheelock, Wybunbury, Bunbury, Tarporley, Holmes Chapel, Sandbach, Winsford, Middlewich & Alsager.